Overcome Fear Of Public Speaking. Articles. Fresh New Thinking. "To permanently overcome your fear of public speaking you must first understand more about fear itself." Read this short story and then read the other articles by clicking on the links lower on this page. As you read these articles, your self understanding will grow. When that happens you'll never be afraid of speaking, or anything else for that matter, again. Let's look at the simple analogy of a lion-tamer. Here's a person who willingly gets in a small space with an animal that could kill and eat them. Most of us would experience fear in that situation but the lion-tamer does not. Why? Because they understand the lions. Imagine for a moment what would happen if they followed so-called 'conventional wisdom'. I mean any 'right-minded' person would be absolutely terrified facing these beasts in a cage with no easy escape route armed only with a small whip. 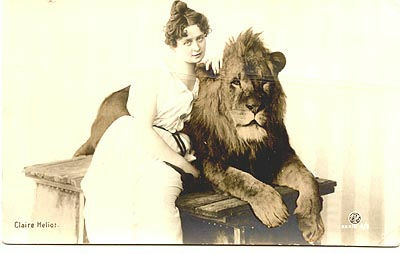 Imagine what would happen if the lion-tamer 'came to his senses' and tried to flee. That's right ... lion lunch time! So in this scenario, not only is fear the 'common sense' response, but it's also absolutely the wrong response and will almost certainly result in a disastrous outcome (for the lion-tamer at least). Question everything you've ever learnt about fear. You'll probably find that most of it is untrue and even damaging. As Socrates said "The unexamined life is not worth living". He was right of course. It's time to start examining your own fear of public speaking by reading these articles. An inspirational but true story of an ordinary guy who is overcoming the fear. Read about what triggered it, how it's affected him and how he's rising above it. You may be like some people who think that overcoming the fear of public speaking isn't all that important these days. This article explores the huge difference that overcoming this fear can make in your life, not just at work. This may be the most important realization you ever have about your fear of public speaking. You'll see that it's not speaking that you're afraid of. This could be an exciting few minutes for you! This page discusses how we create the fear of public speaking by focussing our attention on the wrong thing. As you read you'll be able to imagine the difference a simple change will make whenever you speak from now on. This article tells the story of what happened to one person as they were struck by speech anxiety. You'll be inspired by what happened to them. This article looks at some of the garbage that's been spread around over the years. Some of it may have been well intentioned garbage, but it still stinks. If any of these fallacies have been bothering you, then this article will help you a lot. We all know that the ultimate proof of overcoming fear is when you take action. The problem is how do you get yourself to speak in public when you're too scared to do it? At last that problem is solved. This article needs to be read and re-read until you absorb its message. This single idea is so powerful it may be the breakthrough you've been looking for. This article goes even deeper into the idea of overcoming stage fright. It shows how you the power of really understanding what you're doing. Do you think that shy people can't ever get over their fear of public speaking? I'm sorry but the evidence is against you. Thousands of shy men and women have become confident, engaging speakers. Read this and then come and be the next one. Understand the technical name for the phobia associated with public speaking. You may be surprised by what you learn. Encouraged too. A fascinating article that explores the phobia of speaking in more detail. It shows just how uncommon it actually is and why that's so important to you. What To Do When Panic Strikes! If you've ever had a panic or anxiety attack as a result of public speaking, you need to read this. This article has a highly emotional story that has helped a lot of people. As you'll learn when you're speaking, emotion is a powerful persuader. Let yourself be convinced by the simple beauty and clarity of these words, especially the story. This article takes an honest look at Toastmasters International. It gives you a simple, clear idea about how they help people get past their fears of speaking.